↑ Peris, S. J.; Rodriguez, R. (1996). 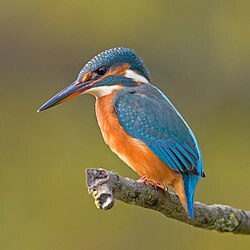 "Some factors related to distribution by breeding Kingfisher (Alcedo atthis L.)". Ekologia Polska. 54 (1–2): 31–38. ↑ Lin, Wen-Loung; Tsai, Hsien-Hsiu; Wu, Hsuan-Ju (2007). "Effect of ditch living thing by process of original structure replacement by RC irrigation ditch" (PDF). Journal of Chinese Soil and Water Conservation (Chinese में). 38 (1): 31–42.